Adorable puppy…or cold-blooded killer? 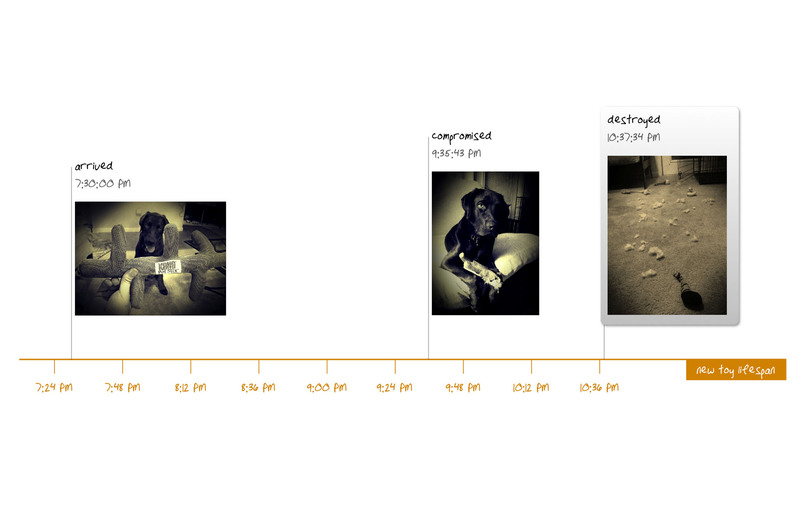 See the timeline for yourself and decide…. Two hours, five minutes, forty-three seconds is the exact amount of time it took Lewis to wrestle his new toy to the ground, gnaw it apart at the seams, and strew the grizzly remains all over the living room. This was supposed to be an indistructable amusement for canines who love to chew. This became an $8 lesson for the humans. This Kong is long gone. He may look like an innocent puppy, but when left alone he’s a cold-blooded killer at heart. This entry was posted in photos, shenanigans, wildlife. Tagged chocolate, destroyed, dog toy, kong, lab, lewis, puppy, shenanigans.